Broncos running back C.J. Anderson has had just about enough of what he deems as unfair criticism of Peyton Manning. Members of the undefeated Denver Broncos don’t much care for your never-ending questions and criticisms of quarterback Peyton Manning. Shortly after the Broncos had beat the Cleveland Browns on Sunday to get to 6-0, running back C.J. 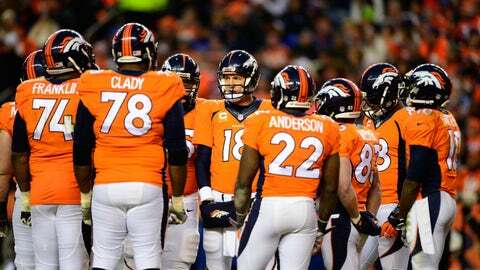 Anderson was finally done with the notion that his team is winning in spite of Manning. “This is stupid,” Anderson said, via Robert Klemko of MMQB. The 39-year-old, sure-fire Hall of Famer was intercepted three times during Sunday’s overtime win, giving him a league-high 10 picks through the first six weeks. Manning is on pace to throw 27 this season, while his 72.5 passer rating would be his lowest in a season since his rookie year in 1998. Only Ryan Mallett (63.6) has a worse passer rating among qualified quarterbacks this season. Then again, Manning did throw a 75-yard touchdown to Emmanuel Sanders, and he led the Broncos for the game-winning field goal in overtime. The Broncos are now 6-0 heading into the bye. The unbeaten Green Bay Packers will travel to Denver for Week 8. The week off could bring some healing and understanding to an offense and quarterback in need of both. Manning’s teammates don’t seem worried. The Broncos rank 13th in points scored and 29th in yards gained per game. A defense with 17 takeaways and four return scores has kept Denver afloat through the ups and downs of Manning’s offense. Greatness may still be the bar from which we judge Manning, but he hasn’t even been mediocre in 2015, regardless of the standard used. Despite the pleas of teammates, the Broncos are winning in spite of their Hall of Fame quarterback.